Abstract.—All Ceraphronoidea have metasomal patches of translucent cuticle and setae that have never been investigated before, despite their potential behavioral and phylogenetic relevance. To understand the internal and external morphology of these structures, specimens were examined using a broad array of histology-based methods, including transmission electron microscopy (TEM), scanning electron microscopy (SEM), confocal laser scanning microscopy (CLSM) and serial block-face scanning electron microscopy (SBFSEM). For the first time, the setiferous patches are shown to be associated with exocrine glands in Ceraphronoidea. The proposed glandular function is the secretion of pheromones, with the setae above the pore openings serving as a surface for evaporation. The translucent cuticle is morphologically distinct from the setiferous patches; structures resembling lamellar bodies were found underneath the translucent cuticle, and may be associated with photoreceptors or endocrine glands. The locations of translucent cuticle on the metasoma are unique to different families and genera within Ceraphronoidea, and could be useful for inferring phylogenetic relationships. The character distribution suggests that the genera Trassedia and Masner are more closely related to Ceraphronidae than Megaspilidae. We found similar structures containing translucent cuticle in Orussidae and Ichneumonoidea, indicating that these structures are potentially a rich character system for future phylogenetic analysis in Hymenoptera. Abstract.—Malpighian tubules are mainly known to be involved in excretion. However, recent studies have begun to look into other potential roles including detoxification, immunity, host establishment, etc. In this case study, we observed the Malpighian tubules of the cabbage looper (Trichoplusia ni) using confocal laser scanning microscopy. We also discuss other functions that Malpighian tubules are known for (i.e. silk-like and gall-inducing secretions) as well as the similarities between Malpighian tubules and salivary glands in endoparasitic Hymenoptera. Three ongoing situations drove me to revamp the course: (1) I get a lot of requests from colleagues to share my teaching materials, and I often found myself uncomfortable with their state (not always clear, sometimes with images of questionable provenance); (2) so many TAs have worked on the materials (often improving, sometimes meddling) that they lost some cohesion; (3) the collection exercise was never quite right, requiring so many specimens/taxa that the resulting product was often not usable for research or teaching (poor preps, sloppy labels, … rushed work). My goal was to rebuild the course, almost from the ground up, and avail the new materials in such a way that they could be iteratively improved, commented on, and used by anyone. See the results at our GitHub repo. I hoped to release the new materials under a Creative Commons Attribution license (CC BY), to maximize peoples’ ability to refine the materials. I think it’ll be a long time before that can really happen, as many of the images I used are licensed in a way that doesn’t allow commercial use or derivatives. I’ll probably get rid of the requirement that lab notebooks be graded. Honestly I forgot about that line in the grading rubric (oops! ), and so everyone got 100/100. They probably deserved that grade, though. These students answered all of our lab questions, many of which didn’t have “right” answers and were not easy. For example, we asked students to hypothesize the function(s) of the elaborate surface sculpturing one can see in Tingidae (see photo below and question 9-13 in the handout). I don’t know the answer if there is one! Students need more guidance regarding how to take field notes – or at least what I expected from them for this aspect of the Discover Your Inner Darwin exercise – and iterative examination of their notes. Their field notebooks were quite inconsistent in their detail. I need to lecture (even) less and bring back required readings that are discussed as a group. I jettisoned this element in order to bring the work load more in line with what Penn State recommends for a 4-credit course (about 160–180 hours of work in a semester). Time to rework the load again. I missed the readings! 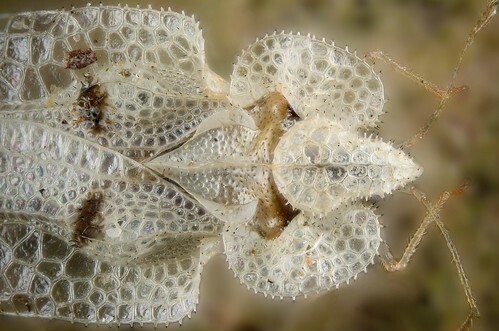 Amazing photo of a lace bug (Hemiptera: Tingidae), by Gilles San Martin (CC BY-SA 2.0) https://flic.kr/p/9hv9Nj. Why is their cuticle so elaborately sculptured? I don’t know! And my students didn’t seem comfortable with that. The observation component of the natural history exercise was really fun for me to witness and read about, and most students found it incredibly rewarding. With more direction from me, and maybe multiple iterations per semester, it could emerge as a highlight for students and an avenue for future research. The collection is also heading in the right direction. Each one was relatively small but sufficiently diverse, and the specimen preps were almost immaculate. Clearly a lot of time and care was put into these collections! The blog post exercise was also good fun, and it was an opportunity for students to dig deeper into observations and subjects that inspired them. The collections resulted in real data that can be used for research! Each student submitted his/her data as Darwin Core Archives, which are basically ready to share through GBIF (I want to doublecheck them first!) With a little help from GBIF, I think we can make this element almost as compelling as the collection. 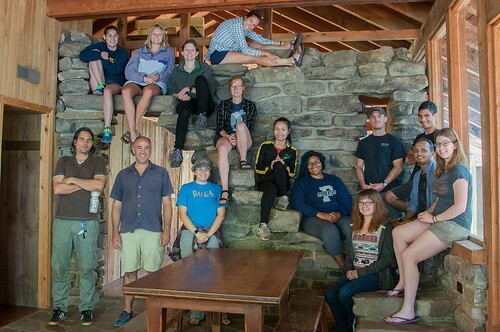 I’ve discussed one possible change with three semesters of students now, and I feel confident now that it’s an idea worth pursuing: I’d love to partner with a likeminded professor at a university relatively close to ours, say within a 6-hour drive of Penn State, for a combined field trip. We mix our students into teams that collect, prep, cook, and learn together … It could be fun! Another possible change to my course could disrupt the potential for any partnerships – a move to the spring semester. Abstract.—A collection of over 60,000 odonate specimens can tell many stories. It can show the successful preservation of dragonflies and damselflies, as well as the differences in prey and habitat associations between taxa. The field notes can share observations and collecting details with those who may have never seen a particular species in the field. A collection of this size can also demonstrate the importance of natural history museums and their contents, enabling biodiversity research decades later. Of particular interest is the mobility of collections in the digital age, as evidenced through the U.S. NSF’s investment in Advancing Digitization of Biodiversity Collections (ADBC) grants, liberating natural history data on which novel research can be conducted. Over the past two years, I have worked with the collection of George H. and Alice F. Beatty at the Frost Entomological Museum at Penn State University in order to digitize the specimens in the collection, catalog them, and find ways to use their data through an NSF Thematic Collections Network (TCN) grant for digitization. When it rains it pours. Here’s the latest open access publication, from István, former lab member Szabina Schwéger, and their colleagues! Abstract.—Our knowledge about gall wasps associated with the diverse East Asian oaks, Castanopsis and Cyclobalanopsis, is limited due to the lack of extensive field studies. Here, we describe twelve new oak gall wasp species, Dryocosmus cannoni Schwéger & Tang, D. caputgrusi Tang & Schwéger, D. crinitus Schwéger & Tang, D. harrisonae Melika & Tang, D. hearni Melika &Tang, D. hualieni Schwéger & Tang, D. konradi Tang & Melika, D. liyingi Melika & Tang, D. moriius Tang & Melika, D. quadripetiolus Schwéger & Tang, D. salicinai Schwéger & Tang, and D. taitungensis Tang & Melika, from Taiwan and mainland China. Seven newly described species induce galls on Quercus subgenus Cyclobalanopsis and five on other Fagaceae genus, Castanopsis. All of the new species concepts are supported by morphological and molecular data. We provide descriptions, diagnoses, host associations for the new species and an illustrated identification key to Eastern Palaearctic Dryocosmus species. We represent natural language phenotypes in a semantic format supported by biomedical ontologies to increase the accessibility of morphological data. Here’s another product of our NSF ARTS grant, albeit not quite as major as our last publication! P.S. We love Biodiversity Data Journal and Pensoft’s ARPHA Writing Tool! Background.—Pteroceraphron is a monotypic genus that can be recognized by its unique, lanceolate wing shape. Until now the only described species, Pteroceraphron mirabilipennis Dessart 1981, was known only from specimens collected in Canada. New information.—Here, for the first time, we report Pteroceraphron mirabilipennis Dessart 1981 specimens collected in the USA. We also provide an extended diagnosis. Our most recent ARTS product is a doozy. Check it out! Also, we love PeerJ! Abstract.—We revise the genus Conostigmus Dahlbom 1858 occurring in Madagascar, based on data from more specimens than were examined for the latest world revision of the genus. Our results yield new information about intraspecific variability and the nature of the atypical latitudinal diversity gradient (LDG) observed in Ceraphronoidea. We also investigate cellular processes that underlie body size polyphenism, by utilizing the correspondence between epidermal cells and scutes, polygonal units of leather-like microsculpture. Our results reveal that body size polyphenism in Megaspilidae is most likely related to cell number and not cell size variation, and that cell size differs between epithelial fields of the head and that of the mesosoma. Three species, Conostigmus ballescoracas Dessart, 1997, C. babaiax Dessart, 1996 and C. longulus Dessart, 1997, are redescribed. Females of C. longulus are described for the first time, as are nine new species: C. bucephalus Mikó and Trietsch sp. nov., C. clavatus Mikó and Trietsch sp. nov., C. fianarantsoaensis Mikó and Trietsch sp. nov., C. lucidus Mikó and Trietsch sp. nov., C. macrocupula, Mikó and Trietsch sp. nov., C. madagascariensis Mikó and Trietsch sp. nov., C. missyhazenae Mikó and Trietsch sp. nov., C. pseudobabaiax Mikó and Trietsch sp. nov., and C. toliaraensis Mikó and Trietsch sp. nov. A fully illustrated identification key for Malagasy Conostigmus species and a Web Ontology Language (OWL) representation of the taxonomic treatment, including specimen data, nomenclature, and phenotype descriptions, in both natural and formal languages, are provided.